Give me the caffeine. NOW. Caffeine has found its way in to a big part of my life. I need my cup of hot java every morning. Without aforementioned cup of java I go crazy. At first I brushed away the caffeine withdrawal symptoms as an every day head ache. No coffee in the morning makes me cranky throughout the day and talking translates to a rock band playing in my head. I feel like I’m carrying the entire world on my already large forehead and you better turn the volume down on the radio lest I punch you. I grew up in a largely ginger tea drinking family. Coffee was present but did not have a big following. A cup every morning or so was not a big deal. But ginger tea was popular. A cup every evening, a cup with some vadai, a cup if there are guests, a cup if you’re sick and a cup if the guests decide to stay a little longer. Six months of living here and tea has taken a backseat. I’ve started craving coffee like I’m on crack (I’m not). 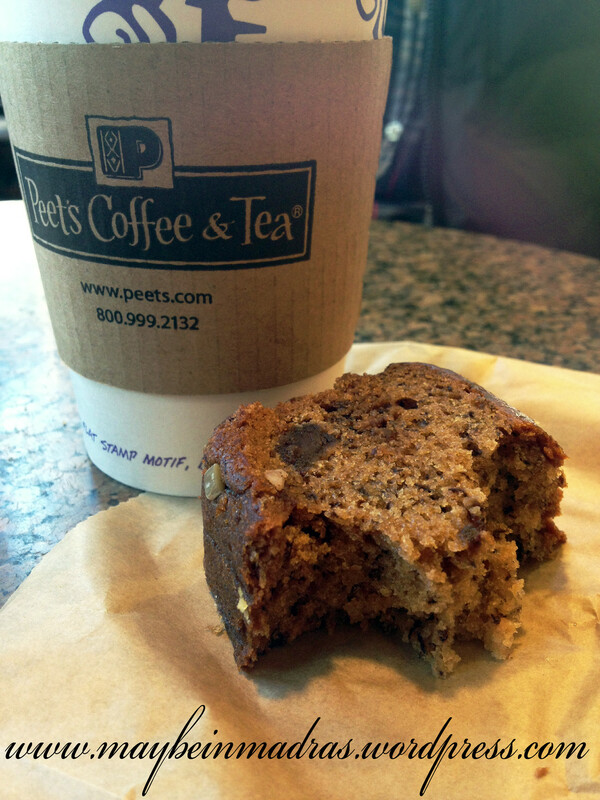 Coffee with banana chocolate cherry bread from Peets and I’m the happiest girl in the world, a little extra caffeinated, but still happy in my delicious cloud. I like the baristas at our local Peets too. There is this one girl who fascinates me. She has streaks of green in her hair. I’d love to get my hair colored in a myriad of colors. but unfortunately for me I will talk the talk but will chicken out when it comes to actually doing it. I’ve been nursing this post for way too long. I’m just going to hit ‘ publish’ now. → I don’t like scallops. I moved from tea to coffee when I moved to US, but now I have stopped drinking coffee because of health issues, but on a car y day I would indulge myself with a cup of coffee , it always perks my mood. Tea also contains caffeine, no? Coffee for me may be able to do the job tea does, but taste wise, cannot match tea. Tea wins for me. The only tea I like is the one my mom makes so I haven’t had good tea in a while! Hi thanks for following my blog. Your posts are funny + you seem almost as nuts as me (in a good way) + I too like frooti = I shall follow you too.